White pedestal cake stand. 1" Scale. 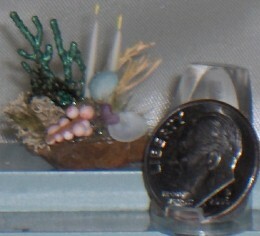 Glass Candy Jar with glass lid from Glass Blowers, 1" Scale. Sterling Silver Coffee Pot from Town Square Miniatures. 1" scale. Cup and saucer with display stand. White with blue floral decal. 1" Scale. White dish drainer with dishes and cup. 1" Scale. Two handled pot with 2 plates. 1" Scale.